WITH thumping rock music, a mysterious metallic briefcase and a blur of shocking pink mohawks, the Japanese duo of Hiropon and Ketch storm the stage. The duo may take some getting used to, but an hour in their company is time well spent. Their comic double act, known as Gamarjobat, will disarm you and have even the most surly member of the audience (yours truly, perhaps) roaring with laughter by the time they are through. If the show I caught at the Actor's Studio Bangsar last week is anything to go by, then Malaysians are in for a real treat. Like all mimes, Gamarjobat rely on communication without the use of words. Facial expressions and props, allied to strategic use of music and the odd guttural emission, are all it takes to get the message across. Without giving too much away, I can tell you that you would not want to arrive late at a Gamarjobat show (unless you're an exhibitionist who enjoys impromptu audience participation ). The first half of the performance is very accessible one, and rather child-friendly. Hiropon and Ketch establish their personalities very early on. (Initially, Hiropon's character comes off as almost abrasive.) They often use the audience as part of their set-up. Their routine is inevitably slapstick, and their act involves both juggling and sword-swallowing. Their humour can get a tad bawdy, but it falls within acceptable limits. Fighting fit ... Hiropon (left) and Ketch measure up to the demands of an energetic performance. The action is superbly paced during the opening section, and quite often, one is still laughing at the previous joke when the next one hits. It might be something as simple as the clever use of football props, or something a bit more sophisticated. The duo certainly showed considerable skills during their "escalator and lift" segment. The second half of the show is subtitled "The Boxer". After kicking off with a classic, tension-building, slow-motion scene, it soon becomes clear that Hiropon and Ketch are acting out a condensed version of the original Rocky movie which starred Slyvester Stallone. While Hiropon stays in character as the boxer, Ketch plays a number of roles, including that of his decrepit old trainer and his love interest. One of the more hilarious moments occur in the scene in which the boxer goes to a pub to drown his sorrows after a bad defeat and his trainer comes to cheer him up. Their subsequent fight for control over the jukebox is quite entertaining. Gamarjobat playing tricks on a young volunteer. But nothing quite matches the numerous fighters Ketch plays during Hiropon's comeback trail. With just a change of headgear each time Ketch demonstrates great skill not only as a humorist, but also as a professional performer (these headgear changes are done on stage – with the aid of that briefcase!) and emphasise the fact that the physical demands on these players are pretty intense. In fact, I was surprised to learn that Hiropon is 40, and Ketch just a little younger! As one might imagine, the love scenes between the boxer and his somewhat nerdy sweetheart are also hard to forget, and I really have to thank Gamarjobat for reminding us just how ridiculous the original Rocky movie was. I must say that parts of this segment dragged although the overall level of entertainment made me forget the time. Incidentally, Hiropon (whose real name is Hiroshi Yoshimi) and Ketch (Keisuke Uchida) were both accomplished solo artistes who went through formal mime school. 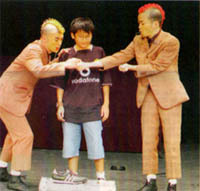 Hiropon studied at the Tokyo Mime Theatre in Shinibu, while Ketch, who made his television debut as a mime at 10, honed his skills at the Tokyo Mime Institute in Maniki. They teamed up after hanging out together at a mime festival in Germany and, using a greeting that a group of Georgian mimes threw their way, styled themselves Gamarjobat. The duo have since gone on to enjoy successful stints in a variety of venues as far flung as Edinburgh and Bangkok. Their time in KL looks set to be every bit as successful.